I made a flying visit to Prague last week, to do a couple of lectures to a conference - Ūdržba trvalkovych záhonů – maintaining perennial beds, I think that means. Frustratingly short, but no time wasted, with two guided tours of two immensely important parks with their botanical collections. “A far away country of which we know little” said British Prime Minister of Czechoslovakia as he handed the country over to Hitler in 1938. We still know little it seems, beyond the fact that Prague is a very pretty city and they make very good beer. Visiting here, I am reminded of the country's fascinating horticultural history, which I suspect is actually one of the most interesting in Europe. Years ago, I think the first time I went to Vienna and stayed with someone who has become a good friend since, Sabine Plenk. I remember her showing me the three volume plant encyclopedia written by Ernst Graf Silva Tarouca in the early years of the 20th century. The volume on perennials was incredibly comprehensive with so many of the plants that we think of as 'modern' and a fair number of good ones we have actually lost to cultivation (such as Aster puniceus); what struck me in particular were some photographs of perennial plantings that just looked so naturalistic and contemporary. So, it was a thrill to step inside the great park of Průhonice, laid out beneath the castle where Silva Tarouca lived. It was his father, Arnošt Emanuel, who laid out the park, in the late 19th century, dominated by vast healthy conifers, the like of which we simply don't see back home. The Silva Taroucas laid out perennial plantings along the lakesides, a very few of which still exist – great clumps of rodgersias can be found in the woods. Today, despite there being only limited staff and funds, there is much restoration planting, and the whole place looks very well cared for and the trees well labelled. I was particularly struck by shaded slopes with masses of clumps of Gentiana asclepiadea. Moravia, during the 19th century, was one of the most advanced countries in the world in the fields of animal and plant breeding and general agricultural and horticultural 'improvement'. Gregor Mendel, remember, was in the monastery of Brno here. The strange thing was that the Czech lands were not independent but ruled by the Austrian Hapsburg dynasty and German was the language of the educated. There is little in English on this period, but years ago, while researching a history of plant breeding, I did come across a pamphlet on the background to Mendel. This made fascinating reading. There were some incredibly good stories here: plant breeding involved monks, countesses and peasants, priests and secret police, of nationalist struggles, repression, religious disputation and occasional violence. Czech and Slovakia are in many ways lands of stories – fairy tales are a big part of the culture here, with much art, theatre, and the very strong tradition of puppetry. One of the best stories was one I had come across, in an extraordinary coincidence only the day before flying to Prague, was that of a Dahlia Society used as a front for nationalist activity, in particular a lady who was once elected the society's annual Dahlia Queen, Božena Němcová, who became one of the key figures in the revival and standardisation of the Czech language. She is commemorated on the 500 Koruna banknote. Indeed, in the Dendrological Garden, a short distance from Průhonice park, and first laid out in the 1950s during the Soviet regime, is a huge display of dahlia trials of modern Czech dahlia breeding. On a hilltop in the Dendrological Garden is a whole area of perennial trial beds. Adam Baroš, who works here as a full-time researcher is trying out a whole range of the German Mixed Planting schemes, so that they can be evaluated for public planting here. The plot that looked the best though was one of his own, based on his collections of 'village plants', varieties collected from country gardens. The gardens of houses in villages are indeed very cheerful here. I remember years ago, when Jo was working in Bratislava in neighbouring (and now independent Slovakia) how we drove the whole length of the country in early June and every village garden was full of peonies and irises. On later travels it was phlox and various daisies. Many of these varieties, probably dated back to the 1920s and 1930s, as clearly did many of the houses – this looked like it had been a prosperous time. The conference was organised by Adam; he has been doing it for 7 or 8 years now and gets more people every time, nearly all garden and landscape professionals. The demographic, tending to the young and with a good gender balance. People seem very enthusiastic. The theme was maintenance, which shows a willingness to engage with what works, not just wanting 'inspiration'. 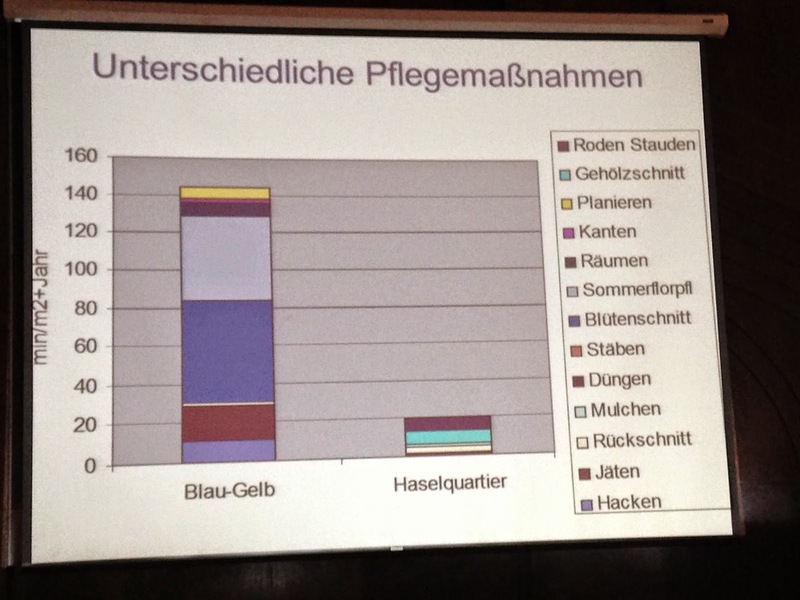 My fellow speaker was Prof Bernd Hertle, from Weihenstephan, who has undertaken research on a wide range of planting schemes where staff time is logged, so that he can show hours per square metre per year figures. Fascinating stuff. Cassian Schmidt at Hermannshof continues to do this. One of Bernd's charts on maintenance of different areas of plantings, I'll get round to translating it all one day. Don't miss the video from my lecture on Piet Oudolf's work, made available by Hauser + Wirth.